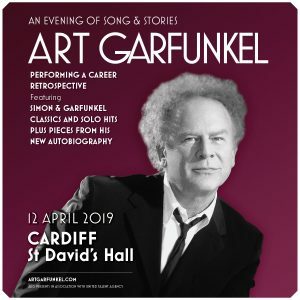 LEGENDARY singer-songwriter Art Garfunkel returns to St David’s Hall on Friday 12 April 2019 with An Evening of Song & Stories from his remarkable five-decade career. Since the 1960s, Garfunkel has received endless accolades including Grammy awards, Golden Globe nominations, huge chart success and a deserved place in the Rock & Roll Hall of Fame. Most famously, the diamond-selling New Yorker conquered the world as one half of Simon & Garfunkel alongside iconic songwriter Paul Simon. Many huge hits followed including Mrs Robinson, The Boxer, Bridge Over Troubled Water and The Sound of Silence. After the duo disbanded in 1970, Garfunkel engulfed on a highly successful solo career. The emotive classic Bright Eyes featured in the children’s animated film Watership Down, and the song went on to become the highest selling single of 1979 in the UK. The multi-talented artist has also appeared in several films including Catch-22 and even penned a collection of his own poetry entitled Still Water. As well his most beloved songs performed live, this special evening also features fascinating readings from Garfunkel’s new autobiography What Is It All But Luminous: Notes from an Underground Man. Tickets are £39.50, £47 & £59.50 (plus an optional £1 postage fee. Tickets for wheelchair users (plus one companion) are £39.50. PLEASE NOTE: The show starts at 7.45pm and there is no support.